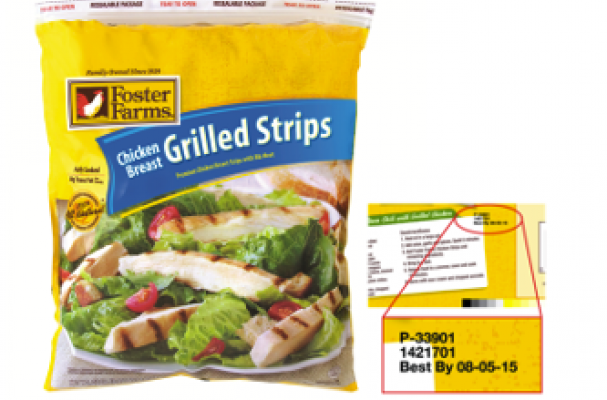 Foster Farms has issued a Class 1 voluntary recall of nearly 40,000 pounds of grilled chicken breast strips that were produced at its Farmerville, Louisiana, cooked chicken facility. The recall involves only the 3.25 pound packages and can be identified by the Plant code P-33901 and a best by date of 8-05-15. The grilled chicken breast strips are being recalled due to the potential of Listeria monocytogenes contamination. This was discovered during a routine testing at the facility. Distribution of the recalled product was limited to two retailers: Costco (Oregon, Alaska, Washington, Idaho, Montana, Utah, Colorado, Texas, Louisiana, California and Hawaii) and Stater Brothers (California). All retailers have been notified and have withdrawn product from distribution. Listeria can cause flu-like symptoms in adults and children and can be especially dangerous for pregnant women and those with compromised immune systems. www.fosterfarms.com or contact the company’s Consumer Affairs hotline at 1-800-338-8051 or info@fosterfarms.com. This is the second recall this year for the company with a Salmonella outbreak that caused at least 634 illnesses in 29 states between March 1, 2013 to July 11 2014. Foster Farms is one of the largest poultry producers in the Western United States. At our local grocery store, they have an honest to goodness meat section. This means they have meat cutters in the back, and you can speak to someone about cuts of meat or ideas for cooking. I buy my meat in bulk and then divide it into smaller portions. Since we raise much of our own meat, this means specialty items like chicken tenders. I buy a 10 pound package of chicken tenders and plan on making an afternoon of it. First, I divide up the tenders into about 12 at a time. Then, I make the gluten free tenders using a GF bread crumb that I season with Italian herbs, garlic powder, salt and pepper. Dip the tenders into an egg and water mixture and then press the bread crumbs on all sides. Place on a cookie sheet and repeat this process until the oven won't hold any more. Bake at 325 until the tenders are just done. Cool to room temperature and then freeze in ziplock bags. No more than 12 at a time means that they bags wont go in and out of the freezer too many times, and the tenders taste fresher all the way to the end of the bag. For the non-gluten free tenders, I just use regular bread crumbs and season the same. It's about 8 cookie sheets worth of chicken and my family loves these! A true convenience food that is healthy. Enjoy!